After the uncharacteristically dry Day Four, the glasses were out again for Day Five. Fortified wines was the topic of the day: Sherry, Port, Vin doux Naturels and Maderia. These wines have never been my strong point: I don't drink them often, see them often, or even talk about them very often. All of this combined to make the Day Five a challenging day. The subject of fortified wines is enormous, so tackling the subject in a single day was always going to be difficult. Of course, the objective isn't to teach the entire subject in eight straight hours - students have to take the initiative and direct their own study around the lectures as well. What was needed for the day? Simple: pen, paper, and 12 glasses. 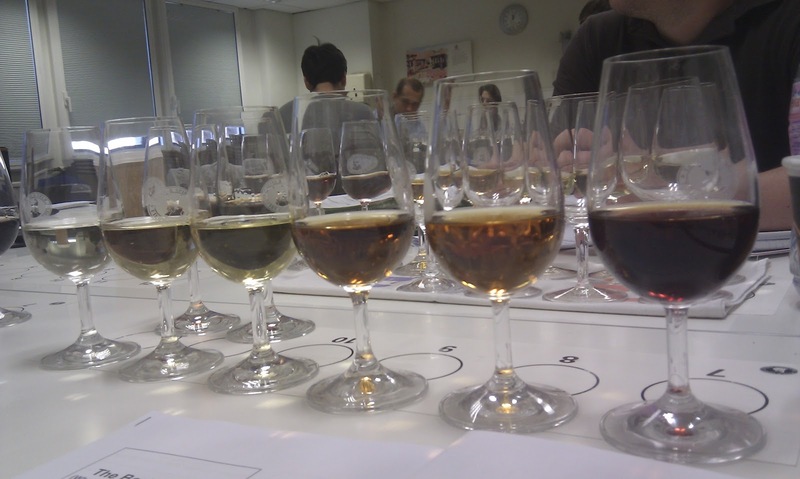 In terms of study, this element of the course is assessed by a blind tasting and short answer questions. For what it's worth, I would recommend focusing on getting a strong grasp of production, maturation and blending methods. Also, as I've said before (though should confess that I don't always manage to follow my own advice), some pre-reading will be enormously useful here if - like me - fortifieds aren't your strongest subject. Day six is next, and it has an exam at the beginning of it, so I'm off to revise now!